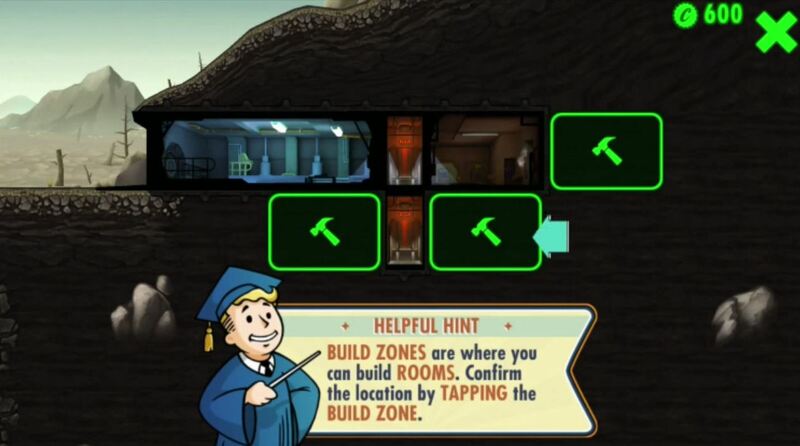 The aim of Fallout Shelter is to build a large bunker. Rooms are selected in the tree-menu, there are three things to start of with a great importance: generators are needed for power generation, in the diner the necessary foods are prepared, also the water supply is necessary. Thus more and more people settle in the plants, in addition barracks are required as rooms that are equipped with man and woman. So the chance to increase the population is also given. As time passes more room types are added. To get more space, rocks have to be destroyed in the soil and elevators are built to reach the lower levels. Every resident of the shelter has personal skills that should be put to good use; the personal satisfaction of each character also depends not only on the supply situation, but also from the personal field of application. The production of the necessary supplies can be accelerated by pressing the speed button, but always noted here should be the risk of accidents. In addition to the construction tasks it is also repeatedly ward off external threats. New weapons help securing the facility in Fallout Shelter. The surrounding area can also be explored. 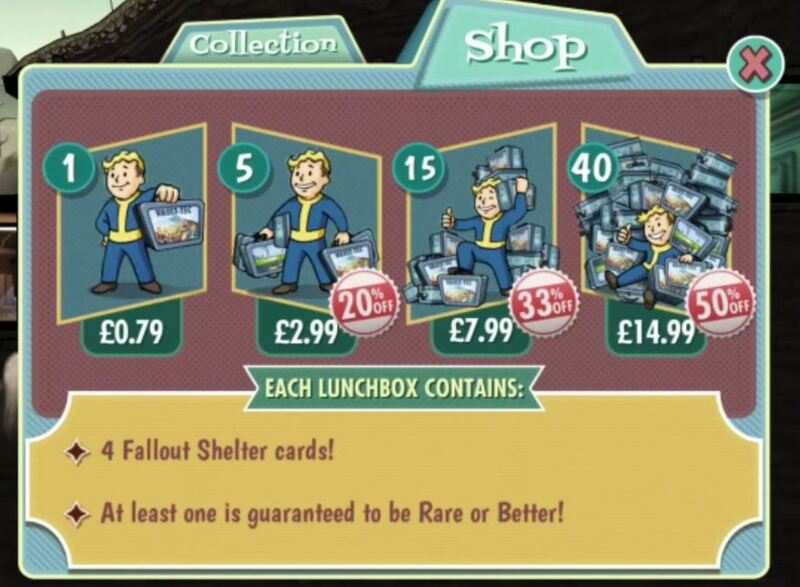 Anyone who wants, can equip one of its bunkers residents with food and send him to explore the wasteland. Overall, the game pace is more leisurely; despite regular supply shortages and emergencies, Fallout Shelter never provides a great deal of time pressure or even panic. 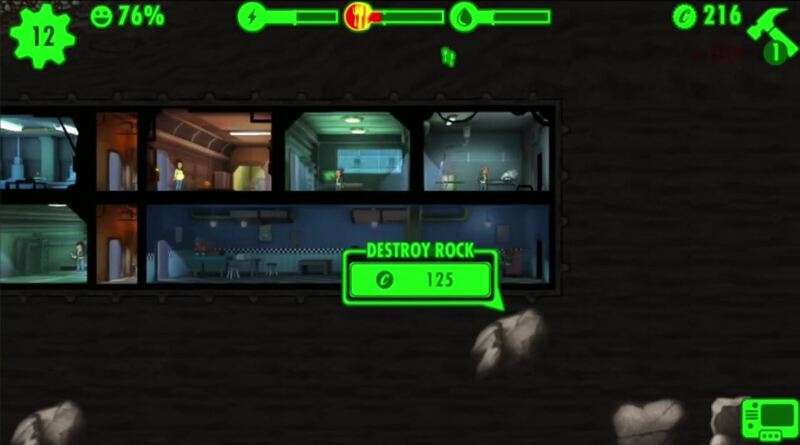 All activities such as building rooms or destroying rocks cost money. The game currency required for this are bottle caps. New Bottle Caps are earned automatically with the production during the game, also many milestones are be rewarded, such as the insertion of people in the right areas. Nevertheless, the bottle caps are usually scarce. To get ahead faster in the game, in-app purchases can be used. However, real money are here not simply exchanged for bottle caps, purchased boxes can contain Bonus Card. What exactly, each box contains can previously not be seen, it’s like a piñata. There are usually next to a different number of crown corks, extras like a new weapon. Nevertheless, the purchase is not mandatory – the game progress also works without real money, but then simply takes much longer. Fallout Shelter is successful designed in rather cute cartoon graphics and features many fun details. Who zooms close to the individual rooms, can observe the inhabitants in partly entertaining actions. The dialogs shown in text bubbles are also fun, the extensive tutorial tips at the start helping even beginners to quickly experience the first success in collecting and building. Fallout Shelter is now available from iTunes for free download. It requires at least iOS 7.0. An implementation for Android will follow shortly. 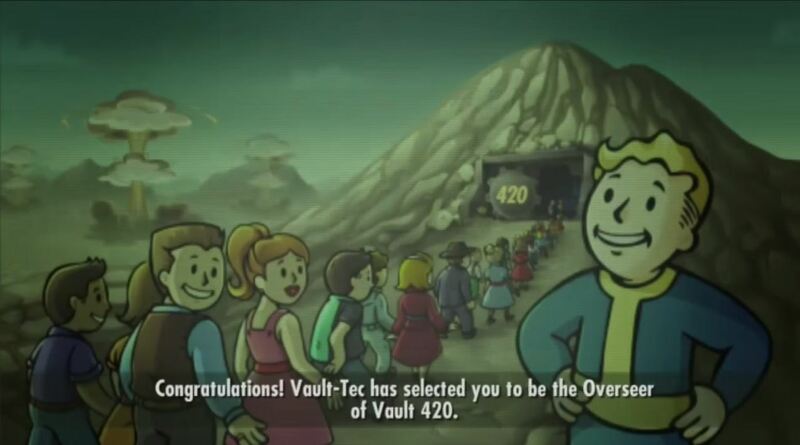 Bethesda Softworks successfully managed the surprise: Fallout Shelter provides an entertaining, well playable mix of pedestrian simulation, collection and building strategy. In addition, convinced as reluctant Bethesda uses the freemium concept – even those who don’t want to use real money, can spend many enjoyable hours with the game. Fallout Shelter is obviously not a replacement for Fallout 4, but a fun pastime. Be the first to comment on "Fallout Shelter Review"